James 1:12–16 Blessed is the man who remains steadfast under trial, for when he has stood the test he will receive the crown of life, which God has promised to those who love him. (13) Let no one say when he is tempted, “I am being tempted by God,” for God cannot be tempted with evil, and he himself tempts no one. (14) But each person is tempted when he is lured and enticed by his own desire. (15) Then desire when it has conceived gives birth to sin, and sin when it is fully grown brings forth death. (16) Do not be deceived, my beloved brothers. Temptation brings us down and leads to bad things but God is the Great Redeemer who loves us to give us a way out. Spiritual trials and temptations come from Satan and they are designed to bring us down. He’s trying to rip us out of the grasp of God. He works to make life difficult and frustrate us so that we give into temptation. I am also a source of my own temptation. I have a responsibility to keep myself under control as I encounter thing that could tempt me. We are all accountable for our actions. That means sometimes I need to stay away from places and people that would tempt us. God is not the problem. 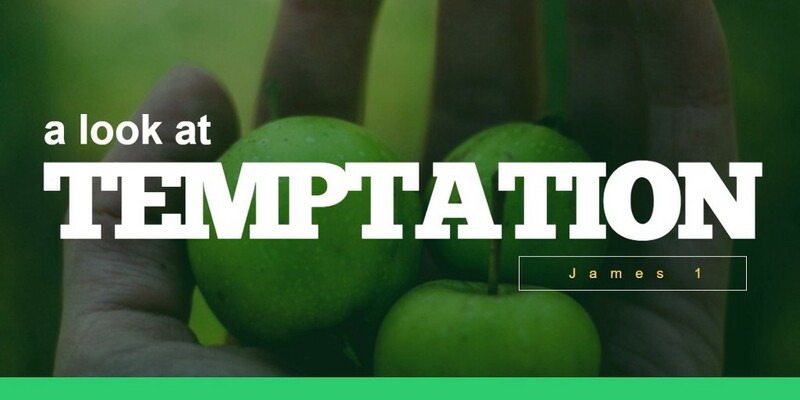 God doesn’t tempt us (James 1:13) but God does allow temptation. We like having choices and that is a result of our design as free moral agents. With the right to chose for ourselves also comes responsibility to make the best choices. If we make bad choices, that’s our fault and not God’s. God could have made us infallible robots who would never sin but that would not accomplish God’s purpose of creating a being that has the ability to chose to love Him. We have been trying to blame someone else for our shortcomings since the beginning. Genesis 3:11–13 describes the blame game after Adam and Eve sinned. God asked them why they did what God had not commanded so Adam blamed Eve and he blamed God for giving him Eve. Then Eve blamed the serpent. They wanted someone other than themselves to be responsible for their sin. The New Testament reiterates the theme that we have no one to blame but ourselves. James 1:14–15 But each person is tempted when he is lured and enticed by his own desire. (15) Then desire when it has conceived gives birth to sin, and sin when it is fully grown brings forth death. What friends do we chose, what entertainment do we chose, which places to we chose to go? Those choices will influence our level of temptation. As the old saying goes, if you play in the coal pile, you’re gonna get black. Are the people with whom you associate yourself going to be your best friends and confidants or are they going to be people whom you must deal with only in passing? 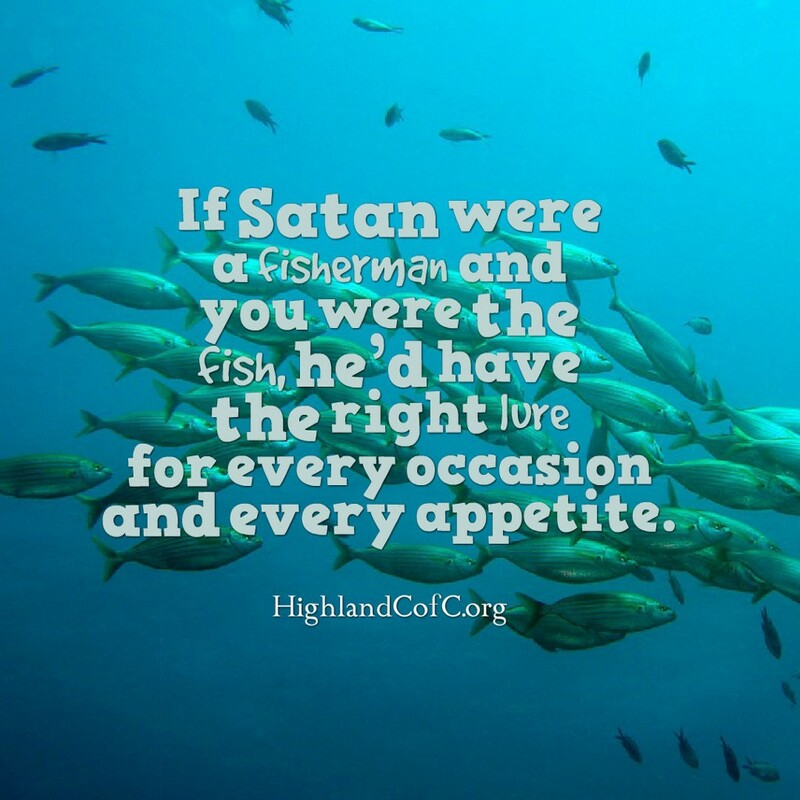 Sometimes we are naive with regard to the power that Satan has to tempt us. If he were a fisherman and you were the fish, he’d have the right lure for every occasion and every appetite. That kind of power means we have to be on our guard every day. It also means we have to prepare ourselves ahead of time to keep from being caught. Stay on guard (James 1:16). James gives the commendation not to be deceived. We can be deceived if we are not on our game. Satan is always looking for holes and moments of weakness so we must not let our guard down. Be sober and vigilant (1 Peter 5:8). Satan is described as a lion — and a man-eating lion at that. We know his ways (2 Corinthians 2:10–11). When temptation comes along we have plenty of warning. We just need to pay attention. We need to recognize where blessings come from (James 1:17–18). God loves us and cares for us and we must continue to look to Him as the way out of temptation. If our focus is upon God and His goodness in our lives then there is no room for temptation, evil or selfishness. Be quick to hear and slow to speak (James 1:19–20). It’s easy to get angry when we react quickly and haven’t even given another person the chance to finish what they are saying. This deals with the temptations and struggles that we encounter with our fellow man, which is a frequent challenge. Substitute the Word of God for selfish desire (James 1:21–22). James tells us the way to put away wickedness in a very specific way: to receive the Word of God. That means we have to give in to God. Let yourself be that lump of clay that God can form and mold into a new creation. But that can’t happen until you have decided to put away wickedness by receiving the Word. And you cannot receive the word without spending time studying that Word. James goes on to describe more about what you do with the Word of God and how a Christian will behave, such as visiting widows and orphans. These are characteristics of the person who walks with God, who is actively on guard against temptation and overcomes it regularly. We face temptation every day so we need to have God in our lives every day so that we can overcome Satan every day.